About "Finding probability using a table"
Recall that a compound event consists of two or more simple events. To find the probability of a compound event, we have to write a ratio of the number of ways the compound event can happen to the total number of equally likely possible outcomes. Jacob rolls two fair number cubes. Find the probability that the sum of the numbers he rolls is 8. 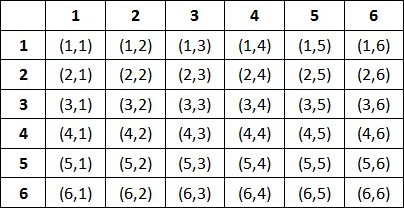 List out all the possible outcomes when two cubes are rolled. There are 36 possible outcomes in the sample space. 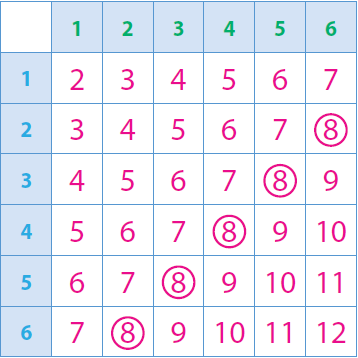 Create a table where each cell represents the sum on two number cubes. Then, circle the outcomes that give the sum of 8. Find the number of outcomes in which the sum is 8. Hence, the probability that the sum of the numbers is 8 is 5/36. A six faced number cube is rolled twice. What is the probability of getting a difference of 2 ?. 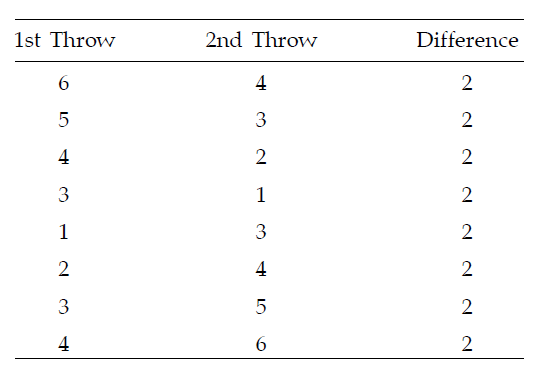 List out the outcomes where the difference between two numbers is 2. Find the number of outcomes in which the difference is 2. Hence, the probability of getting a difference of 2 is 2/9. Two dice are thrown simultaneously. Find the probability that the sum of points on the two dice would be 7 or more. If two dice are thrown then, as explained in the last problem, total no. of all possible outcomes is 36. Thus the no. of favorable outcomes is 21. Hence, the probability that the sum of points on the two dice would be 7 or more. After having gone through the stuff given above, we hope that the students would have understood "Finding probability using a table".